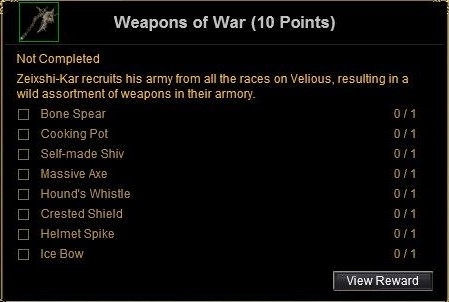 Zeixshi-Kar recruits his army from all the races on Velious, resulting in a wild assortment of weapons in their armory. Here are map locations of those ones I noted while collecting two complete sets (map file: eastwastesshard.txt). They were in and around the giant fort, in and around the orc fort, in a central Coldain camp that wasn't marked on my map (a bit northeast of the orc fort), and in and around the archway that leads to Kael. Found on ground near Giant fort, Orc fort and the entrance to kael.